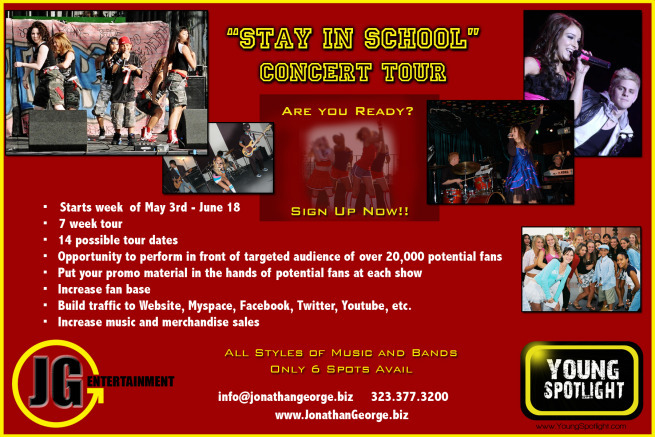 Jonathan George Entertainment and Young Spotlight officially launch the “Stay in School” concert tour. The tour will be begin the week of May 3 and run through June 14. The tour will serve the LA Unified School District and speak a message to youth to stay in school. Serving a double purpose, this tour also gives recording artists and bands the opportunity to gain exposure from a targeted audience. Record labels once sent their artists on school tours to launch their careers. Since artist development is almost non-existent with labels, this tour gives artist an opportunity to take their careers into their own hands. It allows them to gain exposure, create a fan base, and sale their music and merchandise. Email info@jonathangeorge.biz for enrollment form and audition information.